Commerce High School Class of 1927. My husband's father Winfred R. Hall grew up in Commerce. 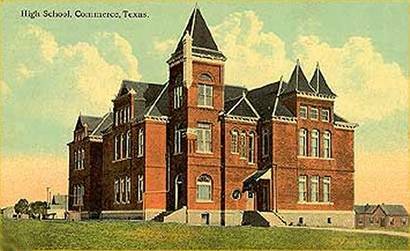 His father R. M. Hall had a grocery store first at the college when it was East Texas Normal. Later he moved the store to 1114 Main Street. They lived at 1714 Church Street. All of the 4 Hall children (Opal, Winfred, Marlin, and Dorothy) attended High School in Commerce. Texas Escapes, in its purpose to preserve historic, endangered and vanishing Texas, asks that anyone wishing to share their local history and vintage/historic photos of their town, please contact us.